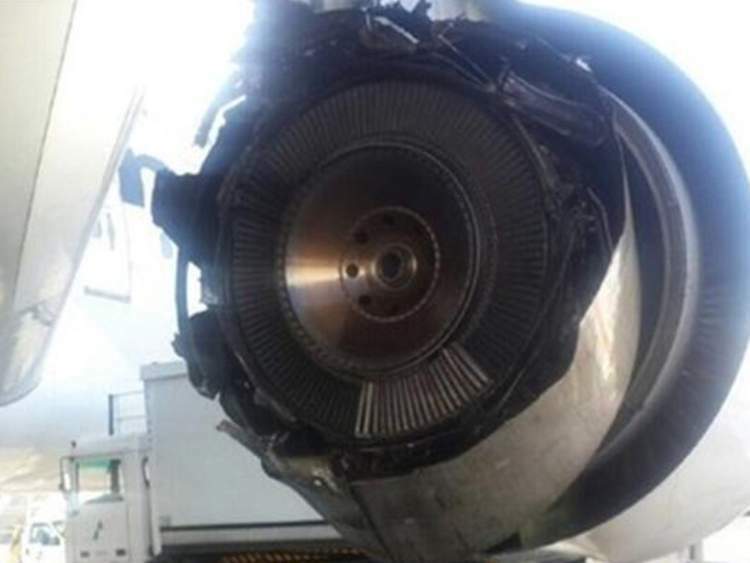 An Iranian plane has made an emergency landing after part of its engine fell apart two minutes after take-off. The Boeing 747, which had 426 passengers on board, had just departed from Tehran's Mehrabad airport when "a piece of engine number three came off and hit the body of the plane". 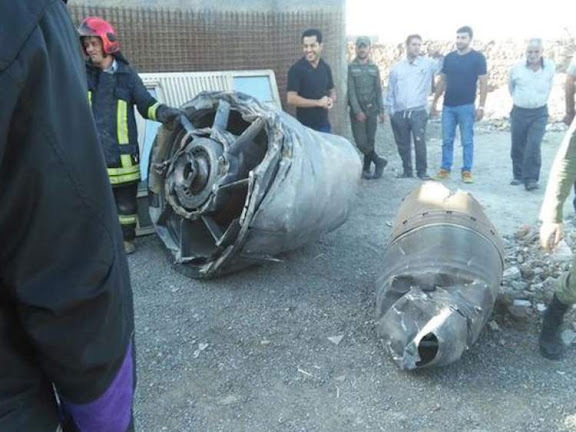 Iranian journalists have claimed the engine part fell into an urban area, but no one on the ground is thought to have been injured. Pilots of the Mahan Air plane decided to immediately return to the airport, and landed it safely just after 7.15am local time on Thursday morning. According to the private airline, the aircraft had undergone all necessary safety checks and inspections prior to departure. Affected passengers were being taken to their destination, the southern city of Bandar Abbas, on a different plane. COMMENTARY: Aircraft was Mahan Air Boeing 747-383, reg. EP-MNE (cn 23480/641). Aircraft air emergency occurred during initial climb, returned to THR after lost part to No.3 engine. 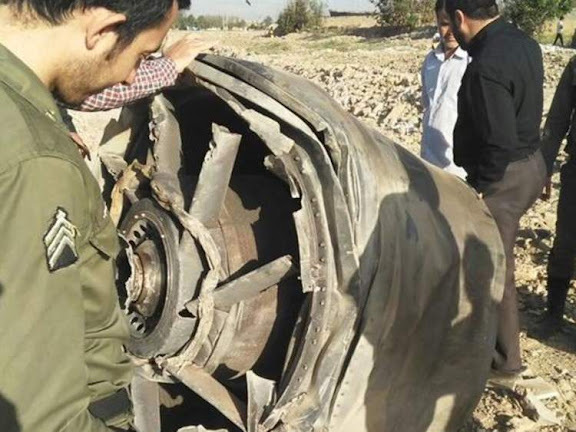 The rear, low pressure turbine, section of General Electric CF6-50E2 engine broke away and fell to the ground in the Eslamshahr country area of Tehran Province. Fortunately there were no casualties aboard the aircraft or on the ground. It's possible this air emergency was the result of sanctions, with passenger carrier not provided relevant service bulletin and access to replacement parts. At a field in the Eslamshahr country area of Tehran Province, a NAJA first sergeant looks over fallen section of General Electric CF6-50E2 engine. Bless those Iranian pilots, they landed operating only the two, port-side engines. And bless Boeing for the soundness of the 747 jumbo jet, the greatest commercial aircraft in history. 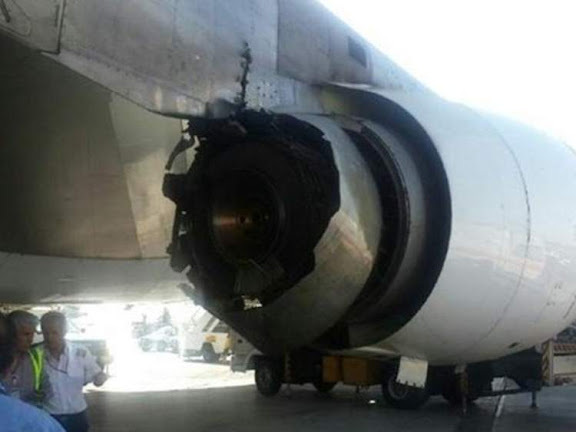 sorry, Pyruz, but damaged engines are NOT "the result of sanctions".......it's the airline's responsibility to insure that engines function properly..and the Iranian govt's responsibility to insure that Iranian passenger airlines don't use aircraft with unsafe engines. it's not anyone else's responsibility....and if there are no proper parts for an engine......then that engine is not to be used...even if that means taking the aircraft out of service. Sorry but I think it's for sure the result of sanctions. Why is the USA so much careless and put sanctions on iranian airplanes? It's possible the Iranians didn't even know of the increased service intervals or the superseded parts. So you're basically saying the Iranians should have taken out of service what they believed to be a sound engine based entirely on an unknown. Illogical.